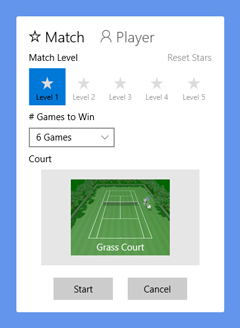 *Level lock/unlock status is managed by both number of games and court type. During a match, you can control character by touch, mouse or keyboard as described below. As a common sequence to give a powerful stroke to the ball, you need wait for a while after taking a backswing till the "Swing Speed Meter"(a red bar that appears beside the player when you begin a stroke) is filled up enough. Move: Use on-screen directional pad to have the character move on the court. Swing: Hold on-screen swing pad to take a backswing, and release it to hit the ball. Move: Move mouse cursor on the screen to have the character move toward it. Swing: Hold mouse button to take a backswing, and release it to hit the ball. Move: Use cursor keys to have the character move on the court. Swing: Hold space key to take a backswing, and release it to hit the ball. *When disc-shaped control pads are not shown on the window, open the sidebar menu and turn on the Touch UI toggle switch. Sound effects: Choose "Default" or "None"
Volume: Changes sound master volume. Touch-UI Options: Changes sizes or sides of the on-screen control pads. Rendering quality: When the game doesn't seem to work smoothly, try adjusting the quality. Functional add-ons are available for sale (the latest version is required to use these features).